The STULZ Micro DC provides a cost-effective solution for rapidly deploying IT capacity exactly where it is needed. This modular and highly efficient solution can easily scale to accommodate the needs of today and the rapid growth of tomorrow, even in space constrained environments. Each micro data center can be configured for low/mid density IT loads, and scale up to higher density workloads with a combination of integrated precision air cooling and Direct Contact Liquid Cooling (DCLC). 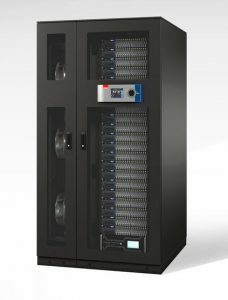 The STULZ Micro DC features a standard 19″ rack which can be easily outfitted with user driven accessories and features. Each modular system can be configured with all of the necessary critical power, distribution, rack security, and cooling integrated to your requirements, as well as cable management and monitoring. It is available in three self-enclosed cabinet designs, each with 48U of standard rack space. Air and liquid cooling modules can be configured depending on the IT load and need for redundant operation. Usable rack space will be dependent on the options selected. Additionally, businesses big or small can scale data center capacity up or down to meet fluctuating demands.